GNOME 3.8 just entered hard code freeze, and this is a release I’m very optimistic about. A little while ago, we all went to some place in Brussels to talk about GNOME, the GNOME Developer Experience, and where GNOME would be going forward. This release sets the stage for everything exciting to come in the near future, like new developer tools (some of which I hacked on), a newer and better Glade, etc. If you’ve tried writing a GNOME application before and was frustrated, we want your feedback. File bugs in Bugzilla, talk to people on IRC, and email the GNOME mailing lists. Please believe me when I say I sympathize with every one of you. Anyway. I’m also excited because GNOME 3.8 is great for users, too. There’s lots of exciting new features. Mattias Clasen already blogged about some of them over there, but there’s one specifically that I want to mention, well, because I wrote it, and I’m proud of it. If you’ve used GNOME 3.6, you may have been annoyed by the message tray behavior: it doesn’t pop up when you want it to, and pops up when you don’t want it to. I always felt that this hurt GNOME 3.6 more than it helped, and there are a large number of bugs related to changing the timeout, or disabling it altogether. The truth is, this was never the plan. It was a last-minute compromise that came about because we couldn’t implement the design we wanted, because it required changes to the X server. In GNOME 3.8, we’ve implemented those changes, upstream, in the X server, so any other desktop environment and program can use them as well. Now, to open the message tray, you simply need to press against the bottom of the screen for a bit of time to open the message tray. The Android ripoff visualizer bar is something I added for the screenshot, but I’m looking into packaging it as a GNOME Shell Extension — it’s a fair bit noisy, so we’re not going to include it by default. It was a fun project, and I learned a lot in the process writing code for the X server. Peter Hutterer has a blog post about the technical details over here. Big thanks to Peter for helping me out every step of the way, along with Christopher Halse Rogers of Canonical for doing a set of prototype patches used in Unity. For those of you who read this blog for tech articles like The Linux Graphics Stack, I’m sorry for a boring GNOME update. I do have a giant article planned, though. I don’t want to reveal my entire hand yet, though. 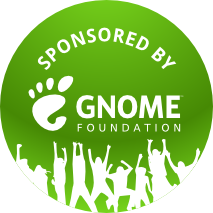 Oh, and thanks to Red Hat and the GNOME Foundation for sponsoring me to go to the DX hackfest. You’re all pretty awesome people. Update: Made the visualizer into an extension over here.